The southeastern state of Georgia has been home to numerous Native American Indian tribes over the centuries. There were first pre-European Indian cultures dating back to 1,000 BC to 1,000 AD. The ones with the most influence in Georgia genealogy would be the tribes at the time the first Europeans arrived. There were the Creek, Cherokee, Yamasee Indians of the Georgia region. The Cherokee tribes were very far-reaching beyond what are Georgia boundaries, reaching into neighboring regions as far north as Ohio. The Yamasee Indians were settled primarily along the Savannah River. Also, along rivers were the Lower and Upper Creek Indians, with settlements by the Flint, Chattahoochee, Coosa, Alabama and Ocmulgee Rivers. With the first European, a Spaniard, Lucas Vásquez de Ayllón, attempted to establish a settlement in 1526 on the island of St. Catherines Island, which is along the Sea Islands, some 50 miles south of present-day Savannah. It would be 1562 before the French try setting up a colony on Parris Island which was much further north. It failed within a year. Spanish explorers like, Hernando de Soto, continued investigating the interior of Georgia and contributed to the decline of the Native Indians by carrying contagious diseases. By 1690, the English, coming as fur traders established a fort on the Ocmulgee River and encountered the Lower Creek Indians. With English forts in the South Carolina area and the Spanish defenses in the Florida region, there developed conflict over the land in-between, that of Georgia. Both sides had continued battles on the land. The last Spanish fort was destroyed by 1704 and the British eventually wiped out the Yamasee Indians along the Georgia coast. A few surviving Yamasee Indians flew to Spanish Florida and a few regrouped with some Creek Indians to form the Yamacraw tribe. Another noble concept was that African slaves would not be allowed in the English colony. However, as the years rolled on and economic conditions in Europe improved, fewer whites were willing to immigrate as indentured servants to Georgia. Eventually the land owners, farmers, found that the African slaves were least expensive form of labor available to colonists. Between 1750 and 1775 there was a massive importing of African slaves in Georgia. The African-American population in Georgia grew from approximately 500 to 18,000 in those twenty-five years. It is believed in understanding Georgia genealogy; the ones brought to Georgia were from the West African coastal areas of present-day Sierra-Leone, Gambia, and Angola. Their influence on the development of the cultural of Georgia, especially along the coast was immense. The Geechee culture (music, dance, clothing, food) of these African-Americans who spent generation after generation on the coastal plantations is still present in selected areas of Georgia. With the start of the American Revolution in 1775, Georgia backed the other colonies in the fight for independence. The Savannah port was captured by the English. It was then that many Africans slaves escaped to the British lines, where they were promised freedom. Almost one-third of Georgia’s 18,000 slaves escaped during the Revolutionary War. 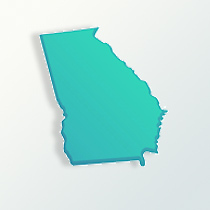 After the war for independence, Georgia officially became a state January 2, 1788. With agriculture, especially cotton, growing stronger across Georgia as the population was entering the 19th century, additional slaves were needed. African-Americans increased in Georgia from 149,656 in 1820 to 280,944 by 1840. A few freed African-Americans became artisans, particularly making clay pottery. In the northern Georgia mountains the first gold rush developed in 1829 bring in new settlers and miners from other states. With new influx of people more lands were needed and the federal government was pressured to remove the Indians so their lands could be settled. In 1830 there was the Indian Removal Act, where all Indians in the eastern states would have to move permanently to the west territory of Oklahoma. By 1838, federal troops were needed to force the Cherokee from their Georgia lands, which resulted in the death of some 4,000 Indians on the long journey westward. The white population of Georgia had changed from English to Scots-Irish as many had immigrated to Georgia over the years. The African-American population was the highest ratio compared to other southern states around 1860. On January 18, 1861, Georgia seceded from the Union to become one of the Confederate States. Many battles and miles of destruction were suffered across Georgia during the Civil War. Many African-Americans as freed slaves moved to urban areas like Atlanta and Savannah for work. During Reconstruction within Georgia, the life for African-Americans did not improve as there remained severe discrimination. By the late 19th century the economic conditions for all of Georgia were beginning to improve. Some new industries developed along with the huge lumbering industry which became very strong in Georgia. Some native Georgia citizens left the state to start fresh in other areas, including settling in northern Florida. By the early 20th century many of Georgia’s African-Americans left the state for jobs in factories in the northern states. Approximately 6.5 million left between 1910 and 1940. By the 1950s civil rights was an important issue in Georgia and the rest of the country. Over the years the state of Georgia population has increased. In 1900 it was 2.2 million, and then in 1930 it was 2.9 million and reached 4.6 million by 1970. In 2009, the state’s population is 9.8 million. The white population is approximately 65 percent and the black population sits at about 30 percent. Only .7 percent of the total population is Native Indians in Georgia. In religion, the Southern Baptist Church is predominating.